On our first trip to Walt Disney World, we wanted to do everything! So my wife and I booked 15 nights at Disney’s All-Star Movies Resort and we commenced visiting every attraction and show the Parks had to offer. We didn’t care what we did first because we were going to do it all! But now that we are seasoned Guests, we tend to take things a little slower. A lot slower actually. We tend to look for the singular moments, the moments that we love to experience over and over again on each and every trip. Drive slowly. Yes, there’s nothing like seeing that big Walt Disney World sign as you approach in your vehicle! And being as you’re not supposed to stop to take pictures, driving slowly allows you to take a mental picture instead. The same thing applies when pulling into your Resort. Don’t rush things, just relax and soak it all in! This is a no-brainer! We always board the Walt Disney World Railroad for a trip around the Magic Kingdom. This helps us to get in the Disney mood and see everything all at once. We always do the complete circuit, boarding and disembarking at the Main Street Station. No matter what you choose to do from there, you’re covered in Pixie Dust and flying high! Well, it’s right there in front of you, so you can’t really miss it. And you shouldn’t! Spaceship Earth is one of Disney’s most magical icons and should be a part of any day at EPCOT. We ride it first for many reasons. It’s an awesome experience. It’s a long attraction, so gives the most bang for your waiting time. And the interactive elements, during and after the ride, are not to be missed. I think it gives a good all around preview of what you can expect from the rest of the attractions in EPCOT. But don’t forget to visit World Showcase! We don’t run to an attraction in this Park. But instead we take a leisurely walk through the streets and shops of vintage Hollywood. Almost always we run into some Streetmosphere characters and have a lot of fun. 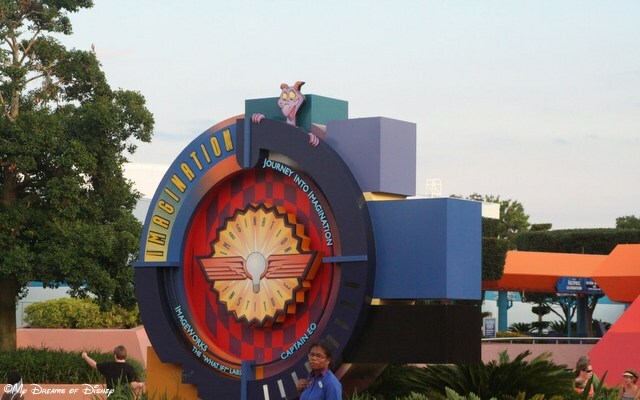 Some complain that DHS is short on thrill rides and attractions in comparison with the other Parks, but I think that was the point in its design. You are supposed to soak up the atmosphere, and that’s just what we do first! Again we head to the icon of the Park. We walk straight to the Tree Of Life and dally in the queue area. It’s not for nothing that this is one of the longest queue lines in the Parks. You walk past and under the roots of this magnificent piece of art and architecture, and if you’re like me, you take hundreds of photographs! Have you spotted each and every creature yet? Probably not, so we go there first and try to find another one. And the It’s Tough To Be A Bug show at the end is a magical bonus! Now, what do we do next? That varies each and every trip! But what do YOU do first?